Boneless chicken breasts (sans skin) are not only a versatile and delicious source of protein, but they’re also a mainstay on many healthy eating plans and diets, often alongside their coveted egg whites and oatmeal counterparts. Most recipes call for baking boneless chicken breast at 400 degrees, but how long does the chicken breast need to bake and what other steps are involved? Why Bake Chicken Breast In the Oven? Baking in the oven is a simple and easy way to cook a chicken breast. You can bake chicken breasts, with or without the skin, at 400 degrees Fahrenheit. This is a little higher than normal baking temperature, so it’s often referred to as roasting rather than baking. Chicken is typically roasted in the oven for 20 to 30 minutes but this can vary based on the amount of chicken you’re cooking and how thick the breasts are. The most important factor, regardless of time spent in the oven, is the internal temperature. The thickest part of a chicken breast should reach at least 165 degrees Fahrenheit. The juices from the chicken should also run clear. Raw chicken may contain Salmonella bacteria so this is an important step to prevent infection. Another important tip to avoid foodborne illness? Rinse the chicken breast and pat dry with a paper towel. Also, do not prepare any other food ingredients on the surfaces that came in contact with the raw chicken before thoroughly disinfecting and/or washing them. We’ve provided our go-to recipe for baking boneless chicken breast (without the skin). This is a great option to make at the beginning of each week because the breasts can be added to so many other dishes to help make a complete meal. Cooked chicken breasts keep in the refrigerator for three to four days. Step 1: Position the oven rack in the center of the oven. Preheat the oven to 400 degrees Fahrenheit. Step 2: Lightly oil a baking dish with 1 to 2 tablespoons of olive oil. You can also use aluminum foil to keep the chicken from sticking to the pan. Step 3: Add the chicken breast to the pan and lightly coat with olive oil. Season with salt and pepper. Tip: If you are using a breast with skin, place it skin side up. Step 4: Bake chicken breasts for 20-25 minutes or until they reach at least 165 degrees Fahrenheit. After seasoning with salt and pepper, you can also add dried herbs like thyme, rosemary, basil or parsley, or minced garlic to taste. You can dress up the recipe above by adding mushrooms, sliced zucchini, spinach, sliced bell peppers or other vegetables into the dish. To cook, place the chicken breast on top of the vegetables. Using a marinade can help create a moist finished product. Easy ideas: Italian salad dressing; olive oil with soy sauce, lemon, garlic and Dijon mustard; or olive oil, lime juice, cumin, salt, cayenne and cilantro. Marinade chicken breast for 30 minutes to overnight. Replace ground beef in tacos with roasted chicken breast. Add chopped or shredded meat, seasoned with taco or chipotle spices. 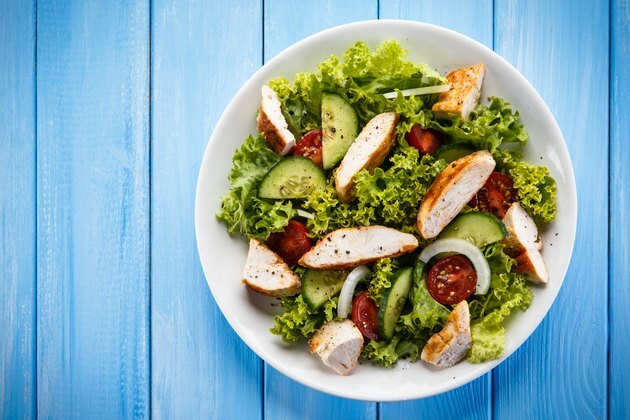 Once cooled, chop chicken breast and use it to make a chicken salad – top on sliced bread or a bed of greens. Slice cooked chicken breast and place on top of a plate of cooked pasta with tomato sauce. Add mozzarella cheese on top of chicken. Enjoy once the cheese has melted. Make the perfect meal by pairing a whole chicken breast with any vegetable and starchy food of your choice (sweet potato, brown rice, quinoa, etc.). What are the Health Benefits of Baked Chicken Breast? 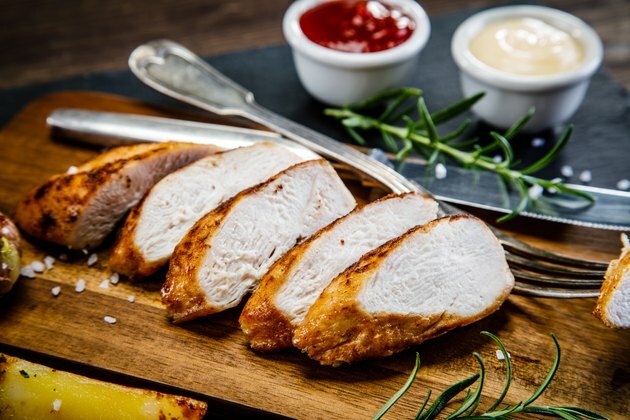 Chicken breasts are a good source of animal protein and the breast meat has the lowest fat content of any part of the chicken. Humans need to eat protein every day. Why? This macronutrient is present in every cell of our body. Protein is made up of amino acids which are the building blocks that help our tissues grow. This includes our muscles, skin, nails, and hair. We’re unable to naturally produce some amino acids so they need to be consumed through food. Amino acids that can only be acquired by eating food are called essential amino acids. Protein is found in many different foods, including meat, poultry, fish, dairy, beans, legumes, nuts, seeds, and whole grains. Protein from animal sources, like chicken breast, provide all of the essential amino acids. 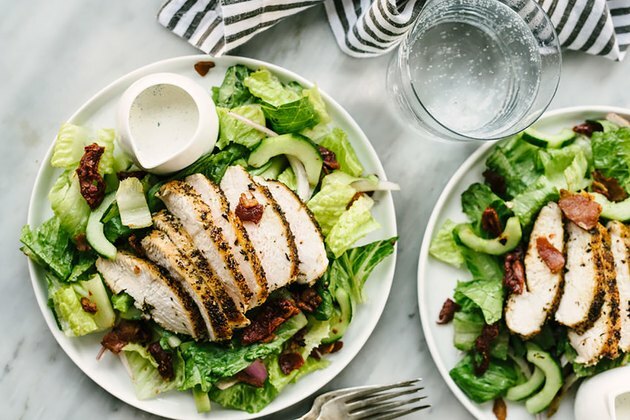 A 3-ounce serving of boneless, skinless, roasted chicken breast provides about 140 calories, 26 grams of protein, less than 1 gram of saturated fat and 0 grams of carbohydrates. This serving of chicken breast also provides 13 mg of calcium, 218 mg of potassium, 194 mg of phosphorus and just 63 milligrams of sodium. What if I buy chicken breast but am unable to use it right away? Cook or freeze poultry within two days of the sell-by date. If the poultry is uncooked, whole or in pieces, you can store it in a refrigerator (36° to 40°F) for 1 to 2 days, or in the freezer (0°F or colder) for 12 months (whole chicken) or 9 months (chicken pieces). Can you cook a frozen chicken breast? According to the United States Department of Agriculture, the answer is yes, but under one condition. Frozen chicken can be cooked directly in the oven or on the stove. The cooking time may be about 50 percent longer. You should not cook frozen chicken in a slow cooker or in the microwave — it must be fully thawed first. What’s the best way to thaw chicken breast? There are three safe methods you can follow: In cold water, in the refrigerator or in the microwave. Boneless chicken breasts, bone-in parts, and whole chickens may take 1 to 2 days or longer to thaw. Once the meat thaws, it can be kept in the refrigerator for an additional day or two before cooking. During this time, if the chicken is not cooked, it can safely be refrozen. Does cook time change when using bone-in chicken breast? Yes, it typically takes about 10 additional minutes to cook chicken breast on the bone. Again, the most important factor, however, is that the chicken reaches an internal temperature of at least 165 degrees Fahrenheit. Academy of Nutrition and Dietetics. Teaching Protein Basics. Ohio Poultry Association. Chicken Nutrition Facts. FoodSafety.gov: Safe Minimum Cooking Temperatures. United States Department of Agriculture: Food Safety Information. Chicken from Farm to Table.